James Knox Polk (1795 - 1849), the 11th President of the United States of America. Daguerreotype by Mathew Brady. Image via Getty. The dispute has pitted descendants against one another, with one saying the move is a “step toward grave robbery.” But supporters, including some state lawmakers, say relocating his body will better preserve his legacy. The state Senate is expected to take up a resolution next week, a first step in relocating Polk’s remains. “He’s a president from Tennessee, and he deserves respect,” said Tom Price, the curator of the James K. Polk Home and Museum in Columbia. A counterpoint from Polk’s seventh-generation niece, Teresa Elam: “Every step they take is one step toward grave robbery,” and, “It would be like taking someone out of Arlington (National Cemetery) and taking them to the family farm and putting them behind the barn.” Damn. “Moving the tomb 50 miles and placing it within or adjacent to the National Historic Landmark setting at the Polk Home would take away a historic element from the Capitol grounds and falsely change the historic setting surrounding the Polk Home,” he wrote, according to the Tennessean. Fake history! What does the James K. Polk Memorial Association have to say for themselves? Hold on to your butts because their response is blistering. “(The) tomb where it is located on the Capitol is the worst memorial to a president in the United States, and for a staff person to say that’s fine is inane,” said Doug Jones, the lawyer for the Polk Museum. In a telephone interview, Jones blasted the letter, dismissing the executive director as a staffer who does not have the authority to rule on the project. “For a staff person to come out to make these outlandish comments is unfounded,” Jones said. Please note that Polk’s eternal rest has, this far, not been particularly restful. 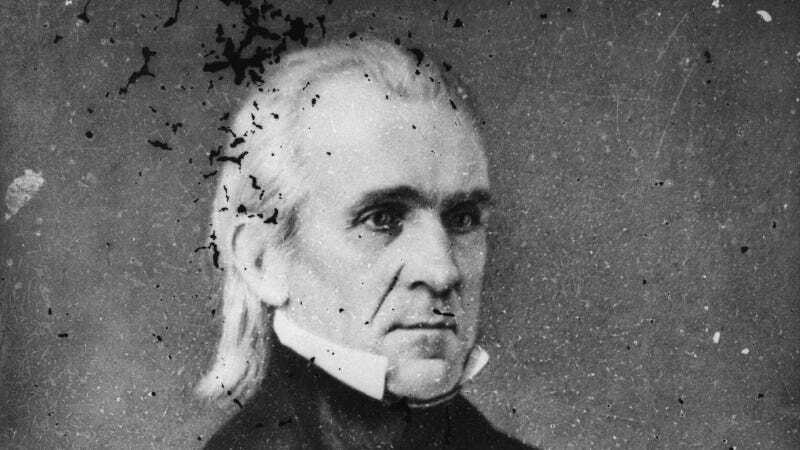 After leaving office, Polk settled in Nashville only to die suddenly of cholera in 1849, just a few months after leaving the White House. To prevent further spread of the cholera epidemic, the former president was buried — with honors — in the Nashville City Cemetery. But about a year later, his body was exhumed and moved to Polk Place, his Nashville home that once sat at the corner of Union Avenue and Seventh Street. His wife, Sarah Childress Polk, insisted the casket be opened so she could confirm that the body unearthed from the “makeshift mausoleum” was indeed the nation’s 11th president. A couple of years after her death in 1891, a family disagreement forced the courts to toss out the former president’s will — which called for his burial at Polk Place — and order the home sold. It was then that Polk’s remains moved to the Capitol. What does a president have to do to get some eternal dreamless slumber around here?